Admin can give Input Final Grades on behalf of the teacher. To perform this task go to Users >> Teacher Programs >> Input Final Grades. Now search for the particular teacher with the search criteria or simply click on Submit to get a list of all the teachers. Click on the name of the teacher from the list. You will get a screen where at the top left you can choose the particular period you will give the final grades for and after entering the grades click on save. To give Final Grades there are a few ways. 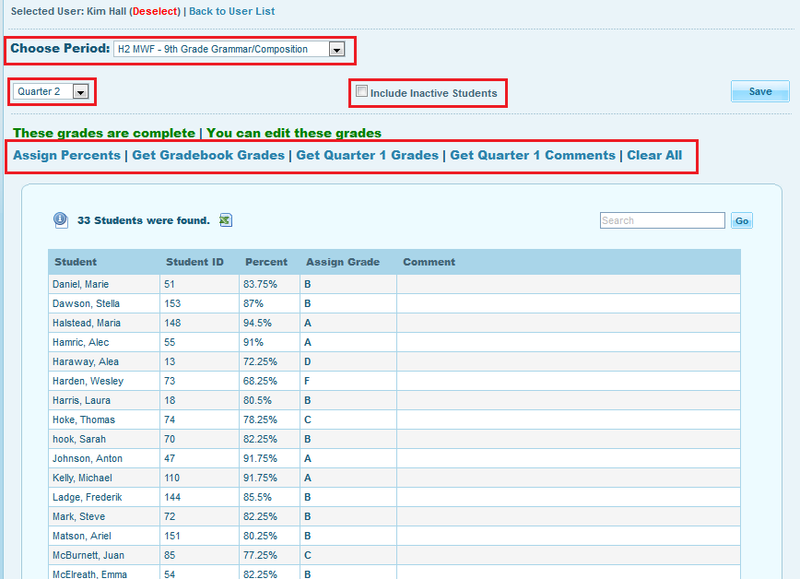 1) Get Gradebook Grades : Fetches the cumulative scores from the assignments given on that course. 2) Assign Percents : Admin can manually enter scores through this option. After entering the percentage, system will automatically fetch the letter grades according to the grade scale set in the system. 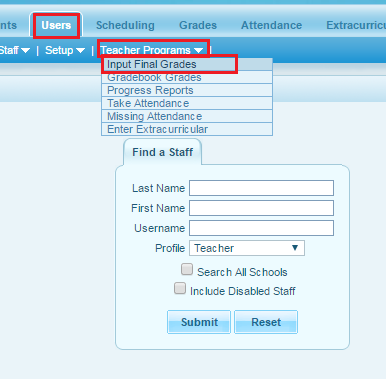 3) Assign Grades : Letter grades can be entered from this option. After entering the letter grades system will automatically fetch the average percentage according to the grade scale set in the system. 4) Get Previous Quarter Grades : Allows you to fetch the same grades that you have entered in the last quarter. 5) Clear All : This option helps the user to delete all the grades given by mistake for all the students. 6) Include Inactive Students : This option helps you to grade the inactive students as well if required. The final grades are now given by the admin on behalf of the teacher and the grades will reflect in the teacher's portal.